There’s no doubt this National School Counseling Week has been the Best. Counseling. Celebration. Ever. Social media is burning up with pictures of kids handing counselors all kinds of goodies, counselors holding up signs explaining why they love their work, and more cookie cakes than the eye can behold. It’s clear the message is out there—counselors are valued, and make a difference. Which makes now the perfect time to go in for the kill. It’s certainly gratifying your principal recognized you in the morning announcements, and that validation may have been enough to get you through a pretty demanding day of too many students to see and not enough time to see them. It’s also true that the sweatshirt that was signed by every student you’ve seen this year is something you’re going to cherish for a very long time. But given the sweat your break getting even half of your duties done, it’s unlikely you’re ever going to wear that sweatshirt, at least at the office. These demonstrations should be valued, to be sure—but they also should be seen as opportunities to move forward. 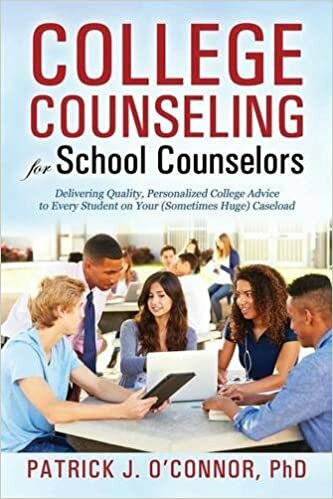 Using the foundation of gratitude and goodwill National School Counselor Week provides, now is the time to engage in thoughtful discussions about the direction of your school’s counseling program, and what others can do to help it grow. How do you begin that discussion? Thoughtfully. Keep the discussion realistic. As much as you’d really like to, this is *not* the time to talk about high student ratios and ask for another counselor (or two, or three, or…) The events of this past week have given a wide array of people a glimpse into everything you are trying to do, and everything you have to deal with. Picking one or two of your most challenging issues to improve is the best way to proceed. Consider the common agenda. Asking for a meeting about a bullying prevention program shows interest in a goal that’s shared by counselors and administrators, and that’s the best approach to take when asking for someone’s help—they’ll be more likely to say yes once they see what’s in it for them. Asking the PTA for funding for a parenting program, working with your athletic director on an athletic recruiting seminar, developing a college essay workshop English teachers can implement in part in the classroom—these all advance their professional goals, and yours. Turn “no” into “not now”. It’s likely some of your well-wishers from this week aren’t ready to commit to a more long-term sign of support for counseling. If you don’t find easy support for one project, try a different one—it isn’t like your program can only grow in one way. Just make sure you leave the relationship on good terms with a potential partner. Once you succeed in other partnerships, they may come talk with you later, eager to be part of a growing program. The reason it’s called National School Counseling Week is to call attention to the importance of your program. What better time to build new partnerships that will help students all year ‘round.